Após algumas disputas relativas aos direitos de autor, a Biblioteca Nacional da Irlanda disponibiliza, de forma gratuita, uma compilação de manuscritos de James Joyce, incluindo rascunhos de Ulysses e Finnegans Wake. Early material; drafts etc. of Ulysses; proofs etc. for Finnegans Wake; the Joyce 2002 Papers fall into three broad categories: early material; notes and drafts for Ulysses; and proofs and additions to proofs for Finnegans Wake. In all there are over 500 manuscript pages and some 200 pages of proofs, together with some typescripts. Early material; the early material consists of a series of notes and translations made by Joyce of Dante's 'Inferno'. It is probable that these were compiled while Joyce was a student. 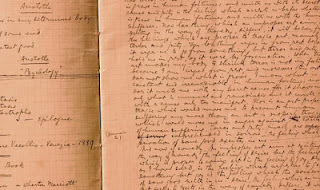 There is an early notebook from the years 1903 and 1904 which provides some fascinating glimpses into the young Joyce during his stay in Paris before his mother's death. The Finnegans Wake proofs fill some gaps in the record documenting the process of getting that work into print. – Collection List No. 68 : The Joyce Papers 2002 / compiled by Peter Kenny, Assistant Keeper. National Library of Ireland, 2002. Ulysses; it is the materials for Ulysses, however, comprising notes, notebooks and early drafts, which make this collection extraordinary. According to Professor Michael Groden, General Editor if the James Joyce Archive, and a leading authority on Joyce's manuscripts, the newly acquired Ulysses manuscripts will immediately be seen as 'the most important collection of early drafts for Ulysses in the world and will instantly catapault the National Library, and Ireland, into a major center for the study of James Joyce.' In support of that view Professor Groden points out that two of the notebooks include the earliest surviving sets of notes, and that there are drafts of no fewer that nine separate episodes of Ulysses; six of these represent hitherto completely undocumented stages of development, five of them are earlier than anything available up to now for the episodes concerned; and one is earlier than any draft of Ulysses that was previously known to survive. The handwriting in these manuscripts matches Joyce's known handwriting from the different periods in his life. His method of writing his notes and his drafts, and his use of coloured crayon lines and Xs to signal his use of material in later drafts, are perfectly consistent with other surviving documents. The manuscripts themselves have been rarely touched over the years, and for the most part they are in very good to excellent physical condition. Joyce first referred to 'my new novel Ulysses' in mid-1915. In October 1916 he said that he had almost completed the first part as well as parts of the middle and later sections. However, the record of his work during these early years is very sketchy – almost no documents were known to exist until now. This adds immeasurably to the significance of the new collection.